10th February 2019, Abu Dhabi, UAE: The Gulf Centre for Aviation Studies (GCAS), the training arm of Abu Dhabi Airports, has been recognized and awarded by the Airport Council International (ACI). GCAS was recognized as the best performing ACI training center in the Asia-Pacific Region, with the highest number of students trained in 2018. 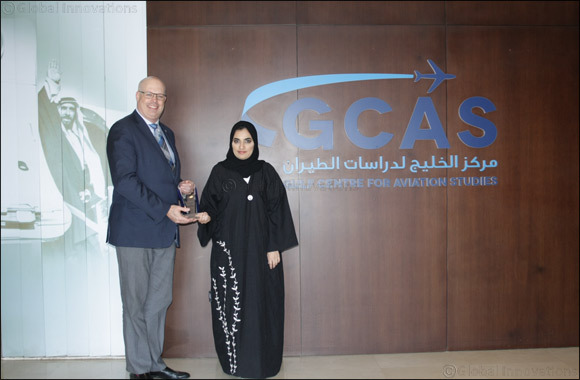 The award was presented by Kevin Caron, Director, Capacity Building Programs at ACI and received by Zamzam Al Hammadi, General Manager GCAS during a special ceremony at the center’s headquarters, located at Al Bateen Executive Airport in the UAE capital of Abu Dhabi. This latest award from the ACI follows GCAS’ numerous accreditations and partnerships with leading regional and international aviation organisations, such as IATA, ICAO, JAATO and GCAA.